During many months of 2011 and 2012 Deville have been stuck in the studio most of the time except for some European festivals and random shows. After two full length albums and a couple of hundred shows all around Europe the new record is a product of that. Trying to take this experience of what the band does best and what works live this new record is more wide than previous releases… This brand new recording will see the light of day in 2013 via the band’s new home here at Small Stone. In 2009, after more than 100 gigs all over Europe since the debut album release it was time for the album “Hail the Black Sky”. Recorded during the early months in 2009 in Malmoe, Sweden by Markus Nilsson and produced by Deville. The band has taken a step to a more straight forward songwriting and this album has more of an album feeling than the last one recording the songs during the same period of time. It follows the pattern of significant Deville grooves and 70`s driven riffing of the darker school. Eleven tracks of rock in the veins of Black Sabbath. Kyuss and Soundgarden it takes you to the next level of 70´s rock for the 21st century.This album proves the bands progress to their own sound in the genre of heavy rock and beyond and will definitely take the listeners for a ride.. The swedish rockband Deville released their full lenght debut “Come Heavy Sleep” in December 2007 on Buzzville Records with great reviews. Two European tours took place in Jan-Feb and Nov-Dec 2008 that went through seven countries. Heaviness and grooves dominates “Come Heavy Sleep” that stretches from stoner rock to doom riffs. 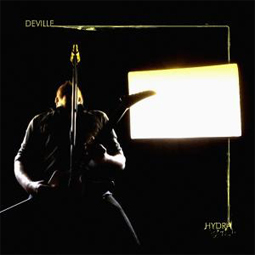 In 2005 Deville released a record on Daredevil Records, a split record (double feature cd/ lp). It was also released in Europe and in the US . The band have existed around six years and have done over 200 gigs and festivals in Sweden, Denmark,Norway,Finland, Belgium, the Netherlands, Germany, France, Switzerland, Austria, Italy, Lithuania, Portugal, Spain and the U.K the past five years with bands like Sepultura, Fu Manchu, Mustasch(S) and Brant Bjork. Recorded at Sunnana Studios, Arlov, Sweden. Recorded and mixed by Markus Nilsson. Artwork, illustration and design by Alexander Von Wieding.